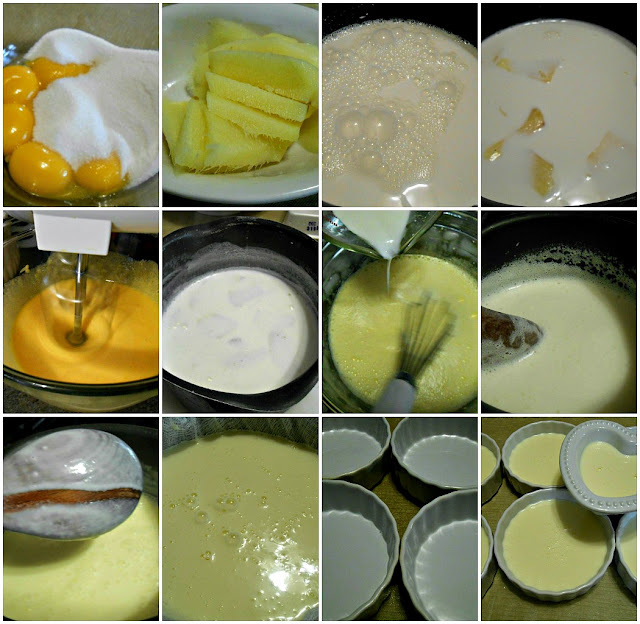 Last year, I was on crème brûlée mode which started in November. I made green tea, Thai tea, vanilla bean; even Nutella which I couldn't get enough of that I had to make it into a casserole with brûléed top. I think I could make any flavor my heart so desires but the one that I really wanted to revisit is the ginger flavored one I made for K. While it had the perfect texture and flavor- I didn't have a torch then and I didn't really do a complete post for that. I thought I'd make it last year too and that was the plan; but I'm a busy girl with so much on the "to make list but with so little time. So tonight, a year and a month after, I recreated it with a little bonus- a slice of roasted pear on top which is sprinkled with sugar before it is torched. Yes, I finally have my own blow torch. Hmm I think I already posted about it being one of the Christmas presents I received last year. I have grown accustomed to the pear and ginger pairing maybe because of the crostatas I made and they're so perfect together. I think I'd roast some more not to use as topping but purely as a snack. I love the chewy soft texture with the spice of the ginger with just a hint of sweetness from the sugar. I'll do a separate post on it for sure. The pear slices are lined up in a cookie sheet sprinkled with two tablespoons sugar and roasted in the oven at 375 degrees until lightly golden and tender. So here's how the crème brûlée came to be. Please excuse the bad lighting- the pictures didn't come out nicer. Hmmm...... I love how the crunchy caramelized sugar cracks when hit with the spoon and the creamy, velvety custard in my mouth with ginger to cut the richness and the bonus roasted pear. I think I should serve extra slices for each ramekin. It's soo good! Oh...so pretty! 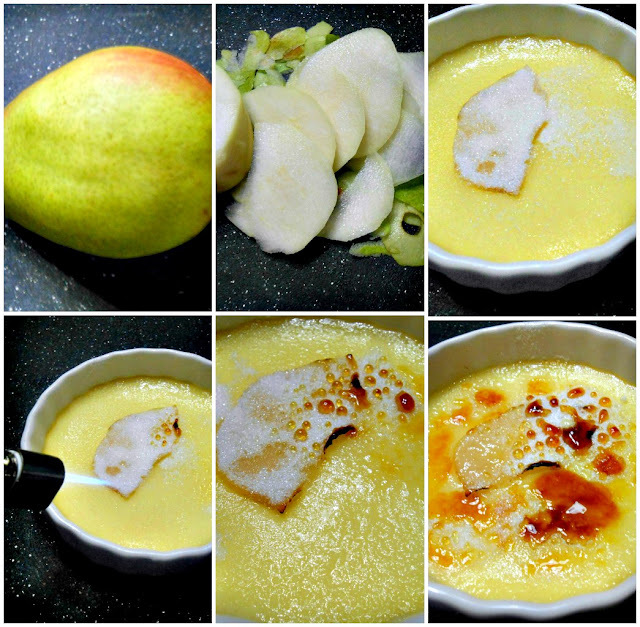 This ginger creme brulee reminds me of a famous Chinese dessert (egg custard with ginger)! This must be heavenly with the brulee nad roasted pear on top! Thank you- it's really a huge compliment coming from you :-) The inspiration actually came from the dessert- thanks to K who told me about it. The roasted pear is a sort of an afterthought but will be a regular component whenever I want to indulge in this dessert.